We speak to Danish pop star MØ about festival memories and new music. Scandinavia is a world-renowned incubator of pop stars, but few arrived as fully formed and original as AURORA. The 21-year-old welcomed us into her weird and wonderful world on debut LP, All My Demons Greeting Me As A Friend — a deeply introspective album that also felt vast, evoking images of snowy plains and dark forests. While the rising star’s music has a wintery edge, it’s also the perfect soundtrack for a desert-based festival. The Norwegian conquered Coachella’s Gobi Tent on Sunday (April 15), delivering a dreamy showcase just before sunset. 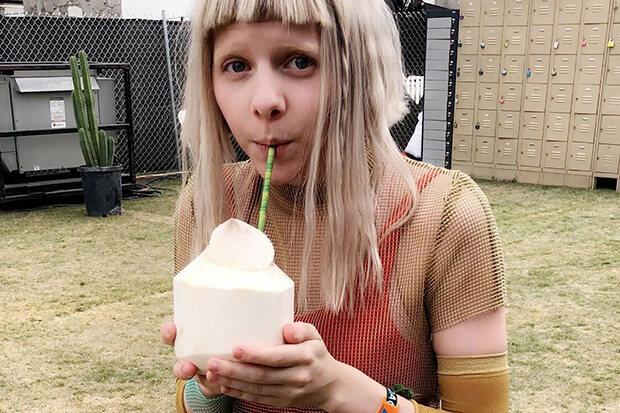 I caught up with AURORA earlier in the day to talk about her Coachella experience. The “I Went Too Far” singer informed me that she was in the mood to dance and promised to focus on uptempo songs. She also opened up about new single “Queendom,” which dropped yesterday, describing it as an anthem for women, mother nature and the LGBTQ community. The hitmaker then revealed a couple of intriguing tidbits about her new album. Get to know AURORA a little better in our Q&A below. Who are you going to watch after your set? Oh, yes. Actually, next weekend I wanna see more people because I’m a bit sick. Next weekend I wanna see Beyonce. I love… are A Perfect Circle playing? I love A Perfect Circle because I love Tool, also. So I really wanna see them with all my heart. I love industrial music. It makes you feel empowered. My next album is a bit … I have a bit of industrial elements involved. Your music is inspired by nature. Will being in the desert add a new energy to your performance today? I think so. It is like being on a different planet. It’s kind of like Mars. And I really like it. There’s something terrifying about it, also, but the same way that a really huge mountain can be terrifying, you know? Because if you get up, how would you get down again? It feels like you could get lost out here. Yes. And it’s kind of a respect type thing when you get overwhelmed by nature — if it’s a big ocean or a mountain, I guess. And I’ve never seen a desert before. This is my first time ever in a desert and I’m really absorbing the beauty of it. I’m so pale. And this is after… I’ve been in Brazil for two weeks. This is my tan. You have an early set today. I love the early sets because they’re different to what I usually do. I love the festivals because after you’ve played a whole half-year of indoor, late shows, it’s very nice to finally be outside and play early. There is something with the crowd in the middle of the day, right before it gets dark, because there’s something magical about it because they’re so full of hope and they have so much like, “Oh, I hope this happens tonight.” And you can see the people are excited. And it’s before they get drunk and tired. You get them while they’re still fresh. Yes. And it’s so romantic I think, at festivals. This early in the day, it’s way more innocent, almost, which I really like. Do you recalibrate your set for a festival? Yes, I do. So I change the set because I know that, “Okay, it’s sunny outside.” So it will feel wrong for me to sing this ballad today because that requires some darkness. And I would like to sing … I don’t know, it depends where I am playing. What do these people want to hear about? What would I like to hear? I just think about all those things. So there will be more uptempo songs? Oh, yeah. I want to dance. I woke up this morning and I just knew that this is a dancing kind of night for me. So I want to dance. You have a new album on the way. Are you nervous given the success of All My Demons? No. I feel very free. It was hard to kind of choose the songs to include and which not, because they are all my babies. And it was kind of hard to select because I only wanted 11 songs from this album. It’s a magic number, 11. It’s the same all ways, backwards, upside-down, which I like. So it’s a magical thing, 11 songs. And we also announced my new single, “Queendom.” So, I’m very free. And it’s because I always know my next step. I always know where to go. I’m never lost. Because if I don’t know, I just know that I need to search a bit more to find it. “Queendom” feels like an anthem to me. It is definitely a statement and an anthem about the female touch in humanity. I feel like we are getting closer and closer to equality, which should be the goal. But it’s also, I feel like “Queendom” is kind of like a mother, you know? Who takes care of everyone who decides to listen to the song or to her. And her arms hold all the women on this earth, but also, she stretches her arms further to everyone who’s had … who can’t get the respect they deserve in this life. Yes. The animals and also, nature, who gets broken every day and she can’t really speak her mind. We have to help her. And it’s about everyone who’s had, what do you call it, resistance, who’s had a hard time. Everyone. And also, Pride, the Gay Pride? It’s also about that as much for me, because it’s about everyone who’s had… it’s time for everyone to be allowed to live to the fullest. All My Demons was a very introspective album. The new one sounds more outward-looking. Touring. Because my first album, I didn’t tour. Many of the songs I even made when I was 11. Like “Runaway.” It was very old, old songs. And the only thing I knew then was me and what I felt in getting to know this body and myself. Now, I know myself and I don’t need to focus on myself as much. I know that I need to, to be able to be kind to the world, of course. So I’m always the first on my list, as you should be. But I’ve met all these people now, all the fans all over the world, and I’ve seen them and I’ve held their hands. And I’ve heard their stories and it just really fills my heart with a different purpose. In France. And I was there for a month in January, next to a wine farm. And it was this castle-looking place. And it had a pond, and there was a dog there and Ginger the cat. And this family who owned the house, it was so large. And you can really hear it on the album. Can you give us a hint when it might come out? Fall, I hope. That’s the plan. Your version of “Half The World Away” is so beautiful. Will you do more covers in the future? I love doing covers of beautiful songs. It’s a way to kind of respect the music of the past and help to keep them alive. And when the younger generations, if they don’t know these songs, it’s a nice way to keep them alive in the world. It’s like they get to live a thousand lives when people cover songs. Is there one song you wish you had written? I don’t know, because there’s not any other song that hits me personally like my own songs can do. It’s hard to kind of imagine. I would have to change a few things, in everything. But maybe, I really… I don’t know. I really love “Across The Universe” by The Beatles. Thank you and good luck for your set. Did you catch AURORA’s electric set? Let us know below, or by hitting us up on Facebook and Twitter!